The National Weather Service has issued a Winter Storm Warning for much of the Tri-State beginning at 7 a.m. and a Winter Weather Advisory beginning at 4 a.m. Friday for a few counties including Hamilton County in Ohio. 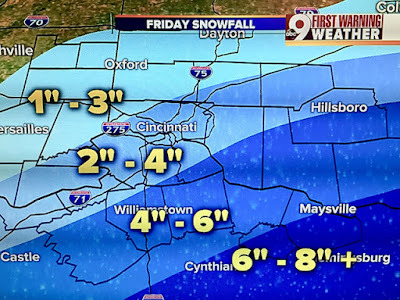 It appears a light snow of a 2 to 4 inch variety would be the case for Greater Cincinnati and points north of town, and a more healthy 4 to 6-plus inches of snowfall is on track for Northern Kentucky and Brown and Adams counties in Ohio. “Over the next 48 hours, a major winter storm is expected to impact many regions of Kentucky— potentially causing ice-related damage, service interruption and impassable roadways. “The National Weather Service has projected snowfalls of up to a foot or more in most parts of the state. Some areas may experience icing and white-out conditions with wind gusts up to 30 mph. These harsh conditions may complicate our ability to effectively clear the roadways and provide essential services throughout the Commonwealth. With the sheer volume and rate of snowfall expected, it's unlikely that even main roads will be clear until after the storm subsides on Saturday. “Transportation Cabinet operators and contract crews will work around the clock to help restore roads to their normal conditions. The National Guard has also been placed on high alert to provide assistance during this time. Midnight: Snow intensity drops and coverage of snow shrinks.